➤ Handcrafted from durable synthetic leather. Leather has stood the test of time as one of the most durable and reliable crafting materials known to man. ➤ The stitching is bold and reliable, creating a case that authentic feeling. ➤ Specially designed silicone TPU cover for protect your phone against serious bumps. ➤ Convenient kickstand function lets you watch movie, play game and browse the web without having to hold your phone. ➤ Soft TPU cover inner velvet lining can protect your phone from inside scratch. ➤ When cover closed, leather case front flip opened small hold provide speak without open the case. ➤ Full access to ports and control allows quick and easy access to all buttons and port openings. ➤ Sold and Quality Guaranteed by Registered US Trademark Spaysi Only. ➤ Delivered in presentation packaging including elegant box and pouch, the perfect gift for yourself or a friend. 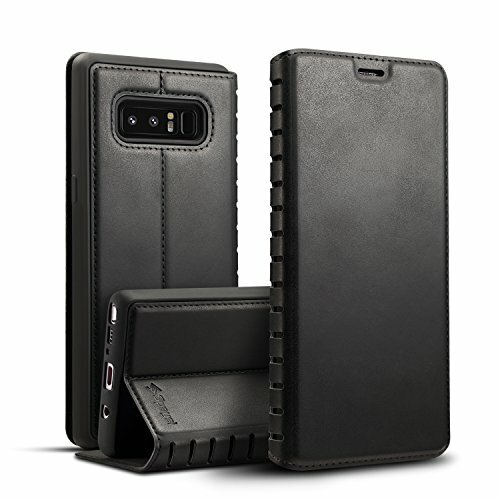 Please Note: This wallet case is only for Galaxy Note 8 not for Galaxy S8 Plus. Please check your phone model. We also have other models available, so if you ever change phones, you can still stay in our SPAYSI case family. Protection for life, so you can enjoy the moments that matter. Spaysi Quality Leather➤ Made from durable synthetic leather provide anti scratch + soft feeling. Special oil wax leather material after using 1-week skin will become more bright and beautiful. 360 TPU Full Protection➤ Specially designed silicone TPU cover for protect your phone against serious bumps also soft TPU cover inner velvet lining can protect your phone from inside scratch. Practical Card Holder➤ The single card slot allows you to carry one of your most used cards with you on time. The case when hold one card can close the flip without any gap. With Luxurious Gift Box➤ Delivered in presentation packaging including elegant box and pouch, the perfect gift for yourself or a friend. If you have any questions about this product by Spaysi, contact us by completing and submitting the form below. If you are looking for a specif part number, please include it with your message.